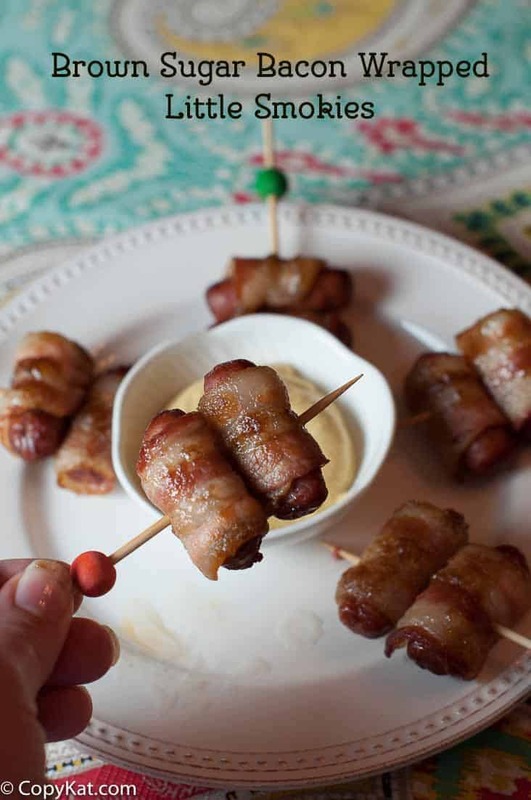 Brown Sugar Bacon Wrapped Little Smokies are the perfect appetizer to make anytime. You can put these together in a jiffy, and I promise the plate never comes back unless it is empty. This is the perfect appetizer to prepare when you are making snacks up for a bunch of people. This can be put together so quickly, and anytime these are served they always the plate comes back empty. Bacon Wrapped Lil Smokies can be made ahead of time, and then heated when you are ready to serve these. For this recipe, I like to use a thin bacon, this way I know that the bacon will cook all of the ways through. What makes these taste so good is that the savory flavor of bacon is combined with brown sugar and the smoky flavor of the sausage. You are certain to enjoy this. I like to make these for a cocktail party, for even for a Super Bowl party. If you enjoyed these bacon wrapped little smokies, you might enjoy some of these great recipes. 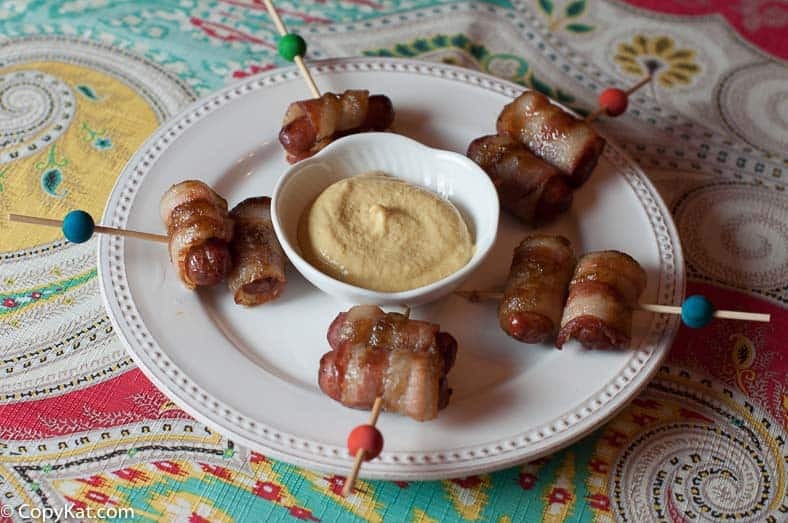 These brown sugar bacon wrapped little smokies go well at a party. Preheat the oven to 350 degrees. Wrap one piece of bacon around one little smokie. Roll the bacon wrapped smokie in brown sugar. Place on a wire rack on a baking sheet. Repeat until the whole package of bacon wrapped little smokies are wrapped and rolled in brown sugar.If you tuck the bacon end under the smokie, there is no need to pin with a toothpick. You can fasten with a toothpick if desired. Cook for about 15 to 20 minutes or until the bacon is done and browned. Made these today for a party later tonight. Couldn’t help but sample at least 5 of them. Yum. Id strongly suggest some tin foil on the bottom to catch the sugar/grease droppings. Combined it turns into tar-like crust. One more thing, what is that sauce pictured with them?. TIA. We make a lot of these, great flavor combination. maybe you could support a “stupid” German: could you explain what a “little smoky” is? Cannot find this expression in my dictionnary. It is a small smoked sausage. They are about 1.5 inches long. You can use the same recipe replacing the little smokie with a date. Try it, it’s awesome!